Developers in Benton Harbor hope a new resort and Jack Nicklaus signature golf course will improve the economically depressed city. 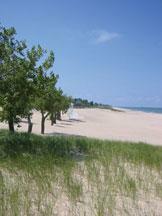 But plans call for three of the golf holes to be built inside Jean Klock Park, next to Lake Michigan beachfront. Activists hoping to save the park have sued in federal court, but construction at the park is underway. Officials with Harbor Shores Redevelopment say they are not building the golf course holes, but instead are working on park improvements as part of a lease agreement with the city. "They're on the beach ripping out 90 year old cottonwood trees and they're hauling away the sand," said Julie Weiss, who is trying to save the park, "It's an interesting rationalization, but in fact this has to do with the golf course." Three protestors tried to protect the trees from the bulldozers in the public park, and were arrested for inciting a disturbance and trespassing.